I couldn't wait to tell you about 11/22/63 - we LOVED this show!! Both my husband and I loved reading the novel by Stephen King, about a man who time travels back to 1960 in an effort to stop JFK's assassination (yes, King write more than just horror). We couldn't wait to watch the TV miniseries...but it was on Hulu, which we don't have. So, I gave my husband the DVDs for Christmas, and we took advantage of the hiatus of our favorite shows during the Olympics to watch it. Wow. This immersive, suspenseful historical drama was well worth waiting for. It's definitely one of my favorite TV shows. James Franco plays Jake Epping, a high school English teacher going through a heart-rending divorce in a small town in Maine (naturally - it's a Stephen King story). He eats every day at his favorite local diner, marvels at the cheap burgers, and becomes friendly with the owner, Al, played by Chris Cooper. One day, visibly unwell, Al asks him to stay after he closes up for the night and shares a terrible secret with him: Al is dying of cancer and needs Jake to finish an uncompleted mission for him. He shows Jake a weird time fissure in the back of his closet, where Jake sees for himself that walking through it brings him to that same spot in 1960. Al has devoted the past years, since he discovered this time rift, to figuring out how to stop JFK's assassination. He's done a lot of research and figures out that things in the modern world started going downhill after that event. He wants Jake to complete his mission for him - go back to 1960, travel to Texas, find out if Lee Harvey Oswald was acting alone in killing JFK, and if so, stop him. After some convincing and Al's death, Jake takes on the mission, with a stop-off in 1960 Kentucky to fix another more personal horrific event from the past first. We were completely engrossed in this mini-series and binged it over a week's time. It's a movie-quality show that perfectly recreates the 1960's, down to every last detail (in fact, a "making of" extra on the DVD explains how they did some of that). The plot - tracking down Oswald, watching him, and trying to figure out if he was acting alone - is riveting and suspenseful, but the scenes of ordinary life are just as engaging. Since he has to stay in the 1960's for three years, Jake has to establish an identity and a cover, so he finds a job teaching English in a small-town Texas high school, where he meets a lovely school librarian named Sadie, played by Sarah Gadon, who significantly complicates his mission. The entire show is so immersive and the writing and acting so good that you forget you are watching James Franco and come to see him as Jake. I also found myself constantly thinking about the show in between episodes and for days after we finished it. I always find time travel plots fascinating for that reason - the convoluted cause-and-effect - plus King's assertion (as with many time travel stories before it) that time resists being changed. It all makes for a gripping, engrossing TV mini series that is well worth your time. King's novel was outstanding, and this TV series brings it to life perfectly. If you are a King fan, watch for small winks to his other stories interspersed throughout the show! 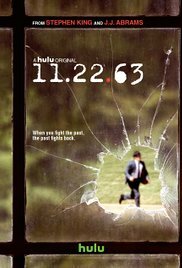 11/22/63 is a Hulu original, so it is available for streaming free on Hulu, but it is also available on DVD, for purchase or through your local library system. You can also stream it on Amazon for $1.99 an episode or $14.99 for the entire season. I am so glad you included the trailer for that show; it sounds so good! I don't have Hulu either but maybe I'll get a free month's trial and watch this.